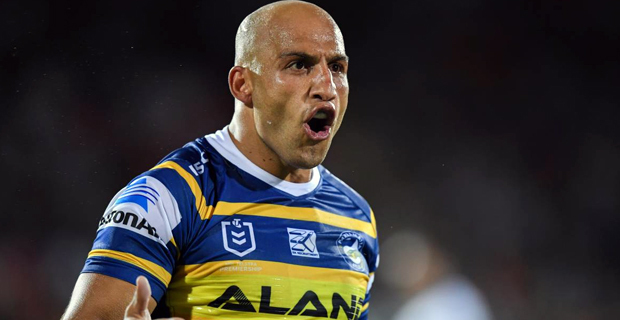 Parramatta winger Blake Ferguson could be set for a stint on the sidelines after being forced from the field during his side's 19‑0 loss to Canberra Raiders yesterday. Ferguson suffered a suspected rib injury in the first half. In other matches yesterday, the Dragons beat the Bulldogs 40-4. Meanwhile, following round 5, the Storm continue to lead with 10 points, in second place are the Roosters with 8 points and the Raiders are in third place also with 8 points. This week, the Sharks face the Panthers at 9.50pm Thursday. On Friday, the Bulldogs will meet the Rabbitohs at 6.05pm and the Storm take on the Roosters at 9.55pm Friday. On Saturday, the Warriors play the Cowboys at 7.30pm while the Dragons meet the Sea Eagles at 9.35am. On Sunday, the Titans will play the Knights at 4pm, the Raiders will meet the Broncos at 6.05pm while the Eels will face the West Tigers at 6pm.